The Bulls Friday looked like a pace car in the midst of the Indianapolis 500. Everyone kept zooming by them in a 105-87 loss to the Indiana Pacers. 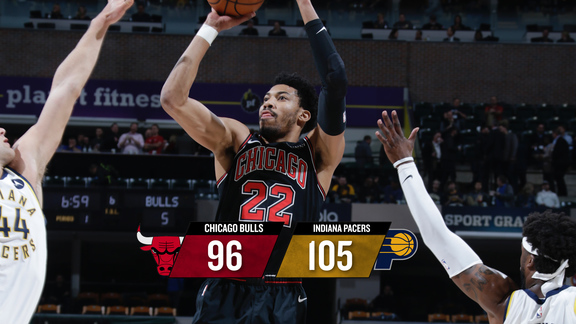 The Bulls were left in the Pacers’ rear view mirror to start and didn’t get their deficit in single digits the second half. The Pacers led the entire game. The Bulls were led by Bobby Portis off the bench with. It was the second consecutive game in the return from his eight-game suspension that Portis has led the team in scoring. He had 20 points and 11 rebounds. Kris Dunn had 16 points, Justin Holiday had 14 points, Lauri Markkanen had 12 points and 10 rebounds. Victor Oadipo led Indiana with 25 points. The Bulls shot 39.8 percent overall and seven of 27 on threes. The Pacers shot 51 percent overall and made a dozen threes. The Bulls fell to 2-8 and play in San Antonio Saturday. The Pacers are 6-7. The Bulls couldn’t keep up the pace at the start. Indiana broke out to a quick 12-5 lead with former Indiana U. star Oladipo keeping up his inspired play since going to the Pacers in the Paul George deal. Oladipo had seven points, five rebounds and three assists in the first quarter as the Pacers surged to a 27-16 lead after one quarter. The Bulls got eight first quarter points from Holiday, but again sputtered on offense with 27.3 percent first quarter shooting. The Bulls made a brief run in the second quarter with a Markkanen jumper and a driving two-hand dunk from Dunn on a Markkanen assist. But the Pacers resumed control with Oladipo, who had 15 in the half. Portis off the bench led the Bulls with eight to match Holiday. The Bulls were just three of 13 on threes in the first half. The unusual oddity was that the Pacers even while leading by as many as 20 points late in the third quarter still had not made a free throw. Donatas Sabonis finally made two with about a minute left in the third quarter as the Pacers went into the fourth quarter leading 80-61. With a Markanen three and driving score, the Bulls looked like they might make a run in cutting their deficit to 54-42 three minutes into the second half. But the Pacers were scorching from the field with a pair of Bogan Bogdanovic threes to regain control. He and Myles Turner had nine each in the third and Oladipo eight as the Pacers shot 64 percent in the third quarter and five of seven on threes. Bulls coach Fred Hoiberg tried a quick substitution of Dunn for Jerian Grant early in the third. But the Pacers hit the Bulls with a 10-0 run on fast break points in the quarter. The Bulls had zero fast break points through three quarters and never could make a run.